2019 Market dates and times have not been set. Check back in May for more information. 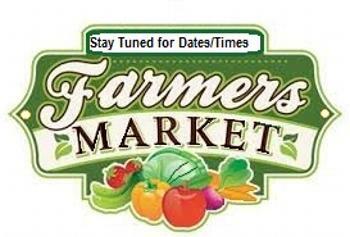 Farmer's Market was closed the summer of 2018 during road construction. We hope to be open Tuesdays and Saturdays (8am-2pm) in the summer of 2019. If we have the vendors, we can open in the spring for vendors selling plants and flowers. Please contact Pete Pickard if you are interested in becoming a vendor at Market. Peter Pickard is our Market Master again for 2019. Please contact Pete with any questions you might have! Farmer's Market Fun Day is July 29, 2017! In addition to our wonderful selection of homegrown fruits, vegetables and baked goods, we will be adding a couple other fun activities for the family to enjoy. A link below has the details! 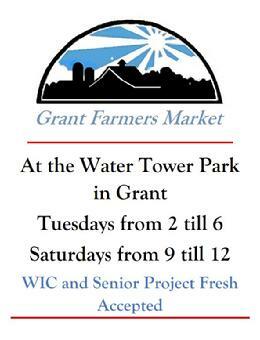 Grant's Farmer's Market will be open Tuesdays 2pm-6pm and Saturdays 9am-noon through the summer and into early fall. Please contact our awesome Market Master, Sarah Grabe, to reserve a space for next spring! Price is $5.00 per Market date, with a Seasonal Rate of $100.00. Thank you Sarah Grabe for being our Market Master in 2015 and 2016!